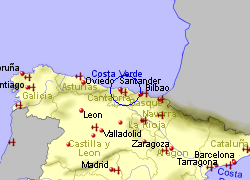 Santander Airport is located 5Km South of Santander, approximately 80Km East of the Picos de Europa mountains. A bus from the airport to Santander bus station costs 1.50 Euros (journey time 15 minutes), running approximately every 30 minutes during the day. There are also bus services to other locations on the coast. 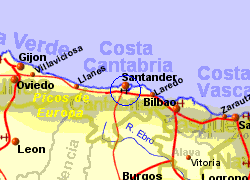 Taxi to Santander costs around 20 Euros. 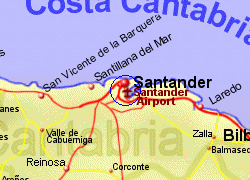 Santander airport facilities include 1 cafe/restaurant, a shop, ATM and a virtual banking facility (via Internet link), and WiFi Internet access.